This weeks outstanding comic cover depicts Green Lantern of space sector 2814, Hal Jordan in his newly redesigned costume. This revamp falls in line with the recently unveiled visual tweaks and overhauls in outfits for DC’s other best selling characters that include, Wonder Woman, Batman, Green Arrow and the Flash. In his new look Hal forgoes his traditional figure hugging spandex styling for a hooded jacket, but still retains his classic mask. 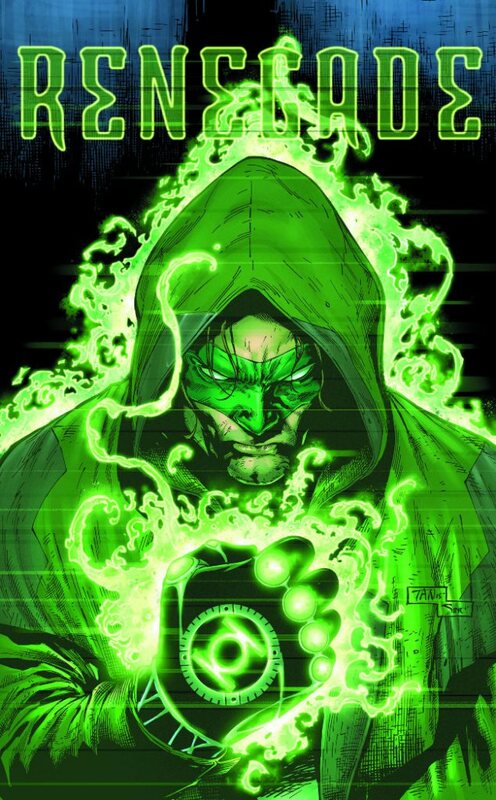 Also of note is the replacement of his iconic power ring with a power glove, this gauntlet was first witnessed in the Geoff Johns penned “War Of The Green Lanterns” published in 2011. Green Lantern #41 marks a new chapter in the life of Hal Jordan as he becomes ‘the universe’s most wanted outlaw!’. Written by: Robert Venditti. Cover and interior art by: Billy Tan and Mark Irwin. Variant cover by: Ben Oliver.